iMobitrax user hits $20,000 daily profit mark. One of the things we don’t talk about much is the fact that iMobiTrax isn’t just a self-hosted mobile ad tracking software. It’s actually an all-in-one mobile campaign tracking dashboard which we use for every single penny we spend on traffic. Whether that’s desktop or mobile traffic. Yesterday, I caught an incoming message from Dino Vedo (DinoVedo.com) whom is an iMobiTrax user. I remember a few weeks ago Dino had messaged me on Facebook, expressing concerns with Prosper 202. This has been coming non-stop since we launched. The amount of people who’ve abandoned self-hosted Prosper 202 and joined us here at iMobiTrax is really quite astonishing. For everyone who can’t seem to figure it out, Prosper 202 is some really old code. It’s not supported or updated regularly and seems like the newbs trying to make Prosper add-ons and hacks spend more time tinkering with it, than having it do what it’s suppose to do – track freaking campaigns. Anyway, Dino was having some issues with Prosper202 and had told me a few weeks ago he was going to gear up with iMobiTrax and give us a shot. The awesome part is that this was all desktop traffic. Dino and I actually spoke a bit more about him working with us on mobile offers with iMobiTrax, but knowing him, he’s probably got a couple of dozen hot web campaigns running right now. That’s awesome news Dino and thanks for the shout-out! It’s Clients like this who keep us awake 100 hours a week hacking away at iMobiTrax and improving it each week. Anyway, I just got some awesome news this morning! It’s 3:32 am and I got this “made my day” message from Dino an hour earlier. 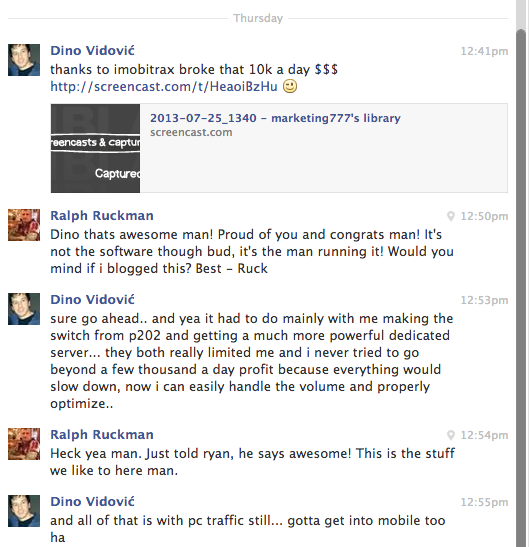 Dino let me know that Bill helped him with a database issue and he hit the $20,000 daily profit mark yesterday. Which since I know Dino, was actually probably more than $20,000 haha! That’s also one of the things about us here at iMobiTrax. Bill is actually in the Philippines while Ryan is on the East Coast and I’m in the Central US (actually boarding a plane to Las Vegas in 2 hours, that’s the reason I’m up ha!). The point is when we say around the clock support, we freaking mean it. We are set on squashing every Self-Hosted Ad tracking platform for Desktop and Mobile that’s out there. Which, come to think of it, none come to mind. 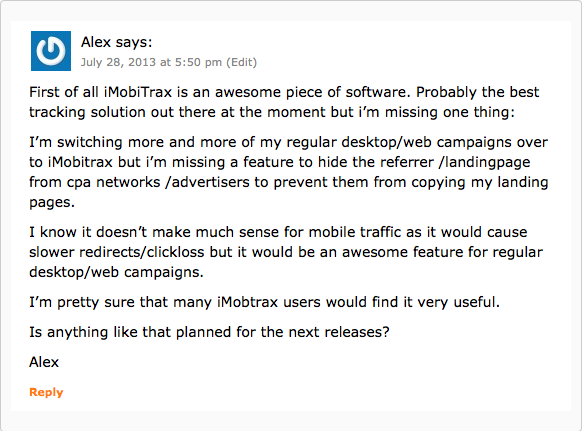 Update: I just saw a great comment from another user utilizing iMobiTrax as their Ad Tracker of choice for Desktop traffic. The answer to your question is yes there is a way to do it, I’ll send you an email because this isn’t really something we want to discuss publicly. This feature is a “hush-hush” for iMobiTrax Clients, so I will answer you ASAP Bro. As demand for our Self-Hosted SaaS (Software-as-a-Service) has risen exponentially over the last 60 days, we are planning to raise our monthly price for new Client users of iMobiTrax when return from the Affiliate Summit around August 20th. So if you snooze, you lose! Get iMobiTrax today and start tracking with the #1 rated Mobile Ad Tracker and quickly becoming a Marketer’s favorite – Desktop Ad tracker too! Interested, What Are You Waiting For! ?